Cognivue® objectively, quantitatively and reliably identifies changes in cognitive function that could be indicative of an impairment that you may optimally treat or manage. 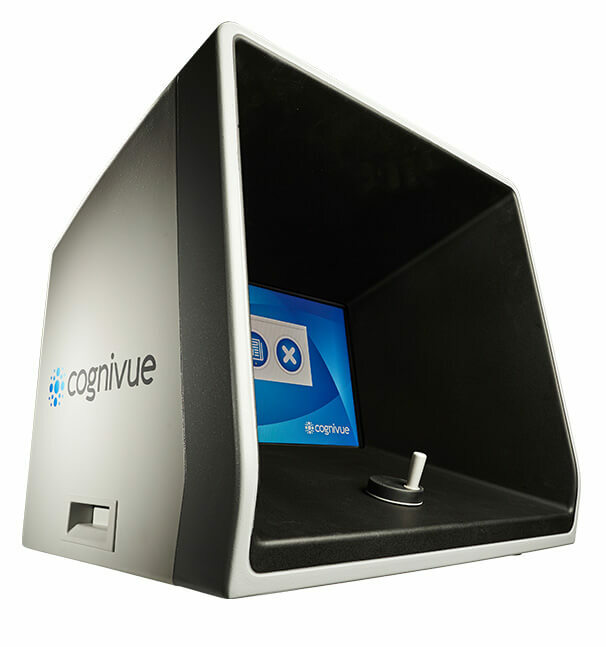 Using adaptive psychophysics, Cognivue focuses on cortical information processing by testing key cognitive domains. Cognivue was intuitively designed to eliminate testing variables. It protects from distractions and light interference and provides the same testing environment between all testing sites. The computerized testing technology is the first computerized cognitive test cleared by the FDA. It is based on years of research focusing on early detection of late-life cognitive decline (LLCD) and dementia. Research began at the National Eye Institute at NIH and continued on to the University of Rochester. A large-scale study conducted in 2014 compared Cognivue to standard neuropsychological tests, and led to the FDA clearance of the device. Cognitive impairment may occur as a result of a variety of causes and manageable underlying conditions. Through routine screening and proper management, we can improve the overall standard of care by eliminating the uncertainty about cognitive function.